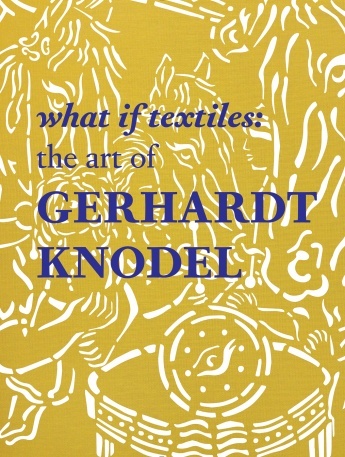 Richly comprehensive, this book gives us a one-of-a-kind look at all aspects of the work of internationally-renowned contemporary textile artist Gerhardt Knodel. Including over 400 images, it documents the development of Knodel’s art from 1969 through 2014. Knodel became widely known for creating huge “environments of cloth” like 44 Panel Channel, a corridor of china-silk panels through which viewers walk, or the three-story-high Sky Court at Xerox world headquarters, a creation of wool, Mylar, and nylon. Knodel has transformed our view of textiles during the past 40 years, and here he describes his goals as well as his interest in the complex language of historic textiles as a stimulus to new work in the fiber medium. Experts share insights on the earlier phases of Knodel’s work; his recent work, including a focus on games; and more. Resources include a biography orienting Knodel’s influences to his works, plus an illustrated chronology. Available at Amazon and Schiffer Books. Gerhardt Knodel: Inhabitations, by Marsha Miro. Portfolio Collection, Volume 16. Telos Publications, 2002. Hothouse: Expanding the Field of Fiber at Cranbrook, 1970-2007. Essays by Gregory Wittkopp, Gerhardt Knodel, Jane Lackey, Brian Young, Glenn Adamson and Rebecca Elliot; Cranbrook Art Museum Publication, 2007. Marshall Fredericks Museum, Saginaw, MI. Gerhardt Knodel @ Marshall M. Fredericks Sculpture Museum, by Glen Mannisto.